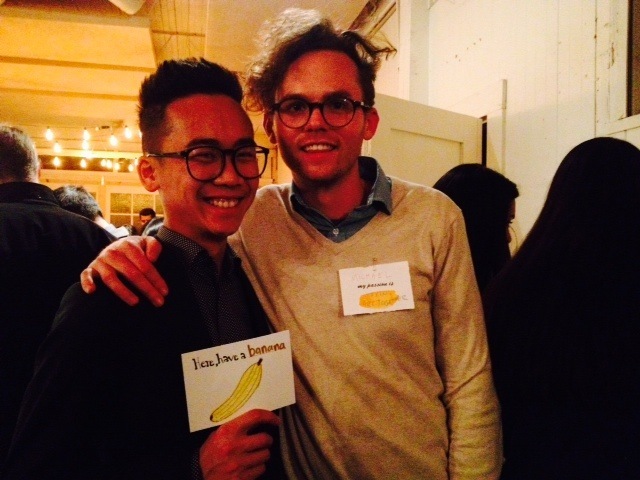 Thanks to a wonderful Bay Area start-up named The Passion Co., I was able to showcase my first ever interactive design project to +100 people. The project, thankyouProject, was created to encourage sharing, creating and expressing what we are each uniquely grateful for. Check out my story here: www.passionstori.es. A blank poster was provided where participants could interactively share using post-its and marker, what they are grateful for. 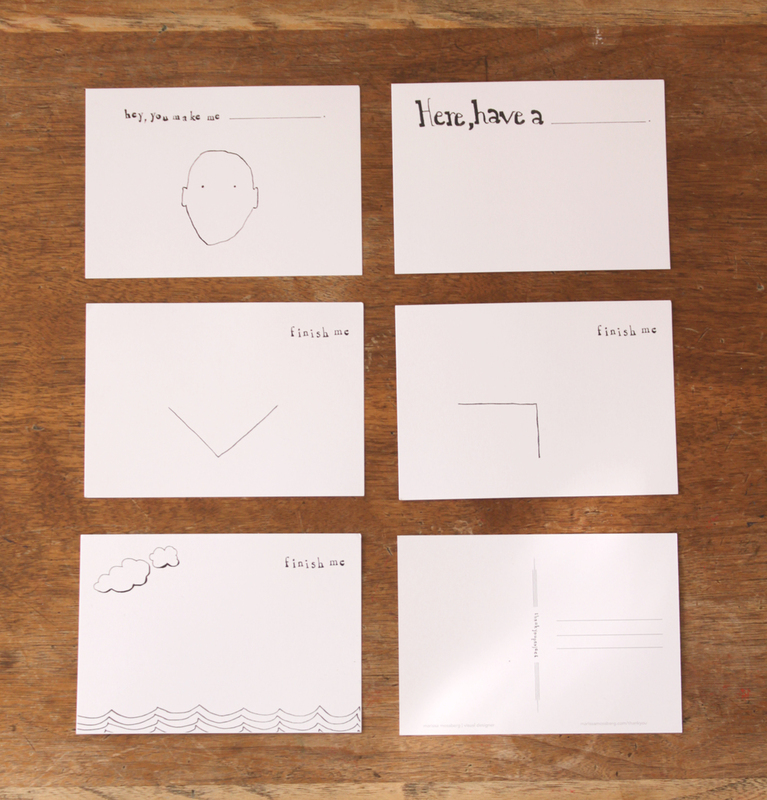 Below the post-it station was a series of 5 unfinished postcards with simple line drawings, blank scenes, or finish-the-sentence prompts upon them. Participants were encouraged to sit down and creatively complete a postcard of their choice and I personally mailed each piece to anyone, anywhere for them. Inks, markers, and rubber stamps were provided. Outcome? Success! 26 participated in the thankyouProject. Participants engaged from 5-10 minutes sharing, creating and expressing their gratitude to strangers, friends and loved ones across the country and the world. Well, it hasn't been too long since something weird has happened and inspired me to create another comic strip. This strip was mirrors a real situation that occurred yesterday evening. About six months ago I had a pretty substantial epiphany. While navigating through a 'normal' day it hit me like a ton of bricks; people create cartoons and comic strips because life is hilarious. Seriously. Have you ever walked down the street and noticed that dog owners look exactly like their dogs? Hilarious. Have you ever been grocery shopping and observed how people interact with one another. Hilarious. Have you ever had a phone conversation with your parents and can not believe how the conversation is unfolding? Hilarious. Get my point? While traveling home to Rhode Island last week to 'connect with my roots' (I am a trip, I realize this) the events that occurred after walking off the airplane were such that they inspired the creation of my first comic strip (seen below). All of the events that you'll read actually happened, literally, with no spin. I know, I can't believe it either. One of the great things about being a left-brainer is that I tend to see, think, and experience design thinking whenever I can. What is design thinking anyway? It might sound abstract to most. I define design thinking quite literally; thinking about the way our world, and the many systems that exist within it are designed to work as separate and collaborative machines. Design thinking can be simple as studying the way a butterfly is painted and the way it moves when it stretches to eat its lunch. Design thinking can be as complex as peering out of your airplane window in the evening and noticing the way a city's light system is structured, and realizing how amazingly cool it looks. Understanding the importance of both the beauty and functionality that exists within our world is what separates designers from non-designers. This blog allows me to share my design thinking experiences with you.